Hip hop, grime, old school, lyrical word play, all styles welcome. 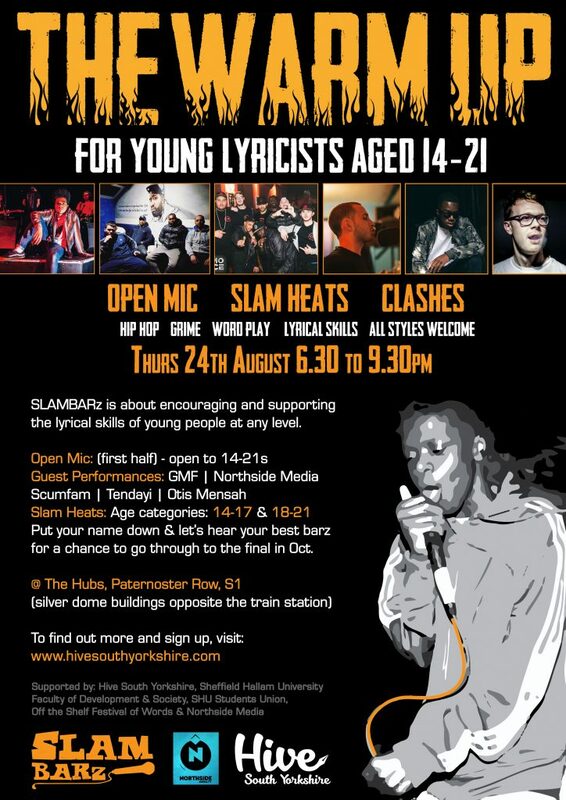 We’re looking for creativity, and inventiveness for the slam finale in Oct, not just spraying barz! All welcome | no discrimination| no haters | good vibes | supportive atmosphere. Do you have what it takes to go through to this October’s finale to complete in one (or more) of the Slam Barz challenges?? You can turn up and put your name down on the night but to GUARANTEE an open mic, or slam heats slot, contact us via: slambarz@hivesouthyorkshire.com with your name, age and which you’re interested in. SLAM BARz comes to you courte sy of young spoken word artist, Dominic Heslop, AKA The Devoted1 (Road Runner), working in partnership with Hive South Yorkshire with much appreciated support from Off the Shelf Festival of Words, Sheffield Hallam University Faculty of Development & Society and Northside Media.